Chiropractic (from Greek chiro– “hand-” + praktikós “concerned with action”) is a complementary and alternative medicinehealth care profession that focuses on diagnosis, treatment and prevention of mechanical disorders of the musculoskeletal system and the effects of these disorders on the functions of the nervous system and general health. It emphasizes manual therapy including spinal adjustment and other joint and soft-tissue manipulation. Traditionally, it is based on the premise that a vertebral subluxation or spinal joint dysfunction can interfere with the nervous system and result in many different conditions of diminished health. Today, this alternative form of therapy examines the relationship between structure and function and its impact on neurological mechanisms in both health and disease. Chiropractors usually obtain one of the following equivalent first professional degrees in chiropractic medicine (D.C. or D.C.M. or B.Chiro or M.Chiro). 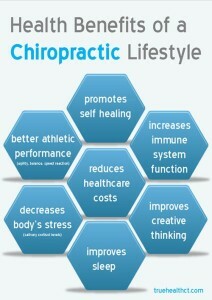 Chiropractors use a combination of treatments that are predicated on the specific needs of the individual patient. A chiropractor can develop and carry out a comprehensive treatment and management plan that can include spinal adjustments, soft tissue therapy, prescription of exercises, and health and lifestyle counseling. Chiropractic was founded in 1895 by D. D. Palmer in the USA, and is practiced in more than 100 countries. Since its inception, chiropractic has been controversial, both within the profession and in the medical and scientific community, particularly regarding the metaphysical approach espoused by its founders and advocated by “straight” chiropractors. This same criticism may have been the catalyst that allowed some within the profession to emphasize primarily a neuromusculoskeletal approach in their educational curriculum, leading them away from the original metaphysical explanations of their predecessors towards more scientific ones.